Although the original predictive model I built for Stanford suggested that GPA didn’t matter, I updated the model using different data cleaning techniques and I now believe that GPA is important to Stanford. Although GPA does matter, GMAT is still much more important. The new Stanford MBA Acceptance Rate Analysis can be found here. Stanford business school has the lowest acceptance rate of 6% out of all MBA programs in the US. I am sure everyone wants to know the secret to increase their Stanford business school acceptance rate. 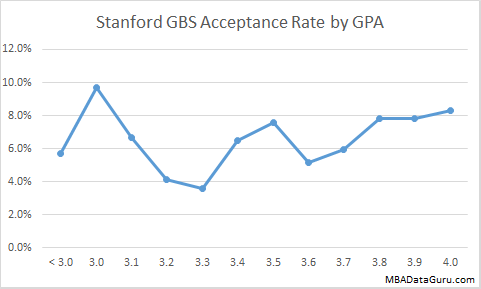 Shockingly Stanford GBS does not care about your GPA. I built a statistical model to predict Stanford business school acceptance rate, and there was no evidence that a high GPA increases your chance of admission at Stanford. 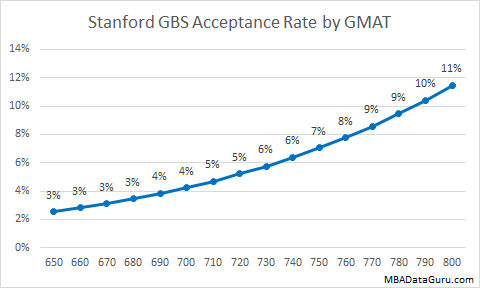 The graph above shows how Stanford business school acceptance rate changes based on GMAT. There is a strong relationship between GMAT and Stanford MBA acceptance rate. Surprisingly, even with an 800 GMAT your chance of admission is still only 11%. Since there are over 7,000 applicants for only 400 spots it is difficult to be accepted. Although GMAT is important to GBS, there is no relationship between GPA and acceptance rate. This is completely the opposite of Harvard where GPA is more important than GMAT. Surprisingly the highest admission rare is for applicants with a 3.0 GPA. Don’t worry too much about the high acceptance rate for low GPAs, there were only 28 applicants with a 3.0, which is not enough of a sample size to be confident. There is however enough data to confirm that there is no strong relationship between GPA and admissions. For those stats nerds out there, the P-value for the GPA variable was 33%, so clearly it had to be eliminated. 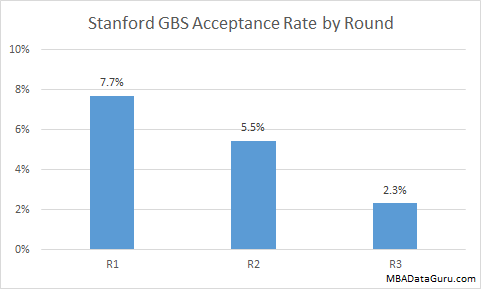 Although GPA doesn’t affect Stanford MBA admission rate, the round you apply in does have a large impact on your chances. The acceptance rate for round one is already below 8% and only drops even lower after that. This is similar to Harvard where application round has a strong impact on acceptance rate. If you are not a perfect candidate with great GMAT and work experience, don’t even bother with round 2 or 3. Might as well wait until next year’s round one unless you enjoy throwing away $250 on your application. 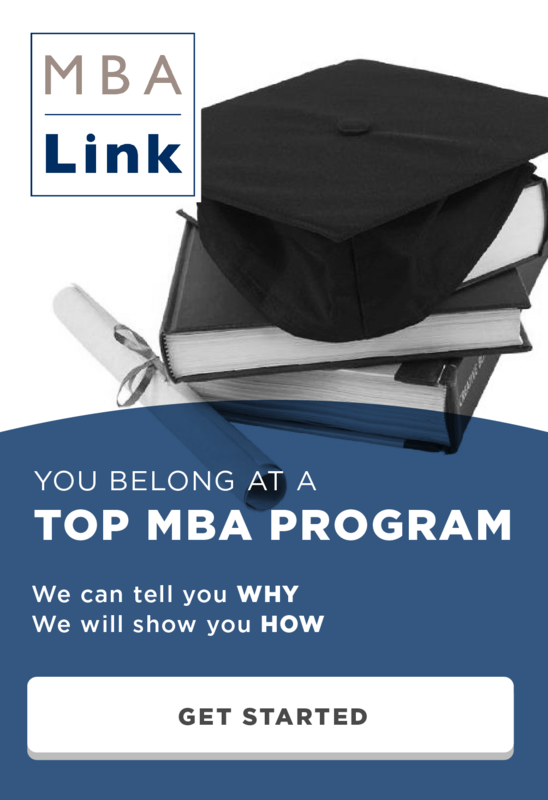 The only other factor that impacts acceptance rate is your pre-MBA industry. Consultants have a 9% acceptance rate compared to other candidates’ 6% chance of admission to GBS. Undergraduate major, years of work experience, and age have no affect on your chances at Stanford business school. The data used to do this analysis came from GMAT Club website. This entry was posted in Admissions, GMAT, GPA, MBA, Stanford and tagged Admissions, GMAT, GPA, Industry, MBA, Stanford on December 18, 2014 by Data Guru.